The amino acid glutamine (Gln) is a primary transport form of nitrogen in vasculature following root uptake, critical for the location/timing of growth in maize and other cereals. Analytical chemistry methods do not permit in situ analysis of Gln, including visualization within the vascular network. Their cost and tissue requirement are barriers to exploring the complexity of Gln dynamics. We previously reported a biosensor, GlnLux, which can measure relative Gln levels inexpensively with tiny amounts of tissue. Here, maize seedlings were given different N rates for multiple uptake/assimilation durations, after which > 1500 leaf disk extracts were analyzed. A second technique permitted in situ imaging of Gln for all leaves sampled simultaneously. 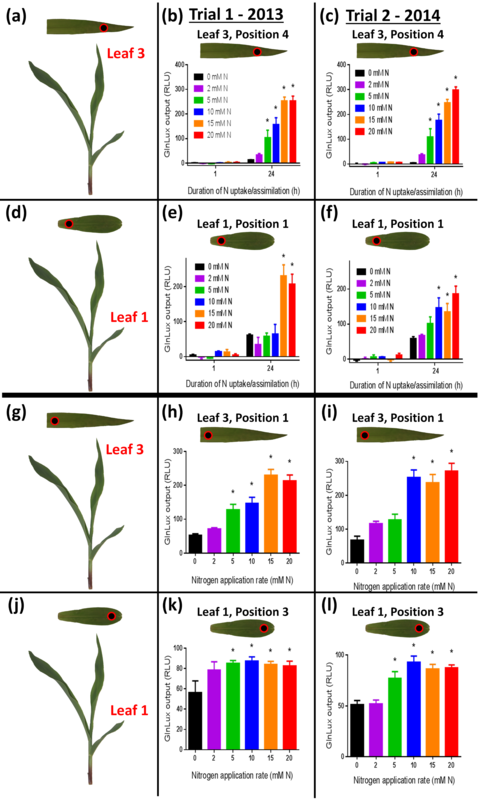 We demonstrate that multifactorial interactions govern Gln accumulation involving position within each leaf (mediolateral/proximodistal), location of leaves along the shoot axis, N rate, and uptake duration. In situ imaging localized Gln in leaf veins for the first time. A novel hypothesis is that leaf Gln may flow along preferential vascular routes, for example in response to mechanical damage or metabolic needs. The GlnLux technology enabled the most detailed map of relative Gln accumulation in any plant, and the first report of in situ Gln at vein-level resolution. The technology might be used with any plant species in a similar manner. Nitrogen (N) contributes approximately 2 % of dry plant matter and is the most important nutrient for plants by quantity [1, 2]. N is crucial for the biosynthesis of amino acids, proteins, nucleic acids, chlorophyll and secondary metabolites, all of which are essential macromolecules . Plant roots absorb N primarily as ammonium (NH4 +) or nitrate (NO3 −). The NO3 − portion is reduced to NH4 + by a combination of nitrate reductase and nitrite reductase (NR, NiR). Free NH4 + is then assimilated into a pool of amino acids by the glutamine synthetase (GS)/GOGAT cycle, and used for a wide variety of biological processes including protein synthesis in young, expanding tissue . In maize (Zea mays L.), nitrogen assimilation occurs in both roots and shoots similar to other species [4–7], and depending on the environmental conditions [3, 8]. One of the primary assimilatory amino acids, glutamine (Gln), displays immediate and rapid increase in leaves following N application to roots as nitrate and/or ammonium, and drastic differences in concentration depending on the developmental stage [9, 10]. As such, the concentration and localization of Gln may serve as a convenient proxy to study developmental-dependent dynamics of N assimilation [11, 12]. Although many studies of N uptake and assimilation have been conducted on a whole-field scale [13–16] or plant scale [17–20], investigations of N spatial, developmental and temporal dynamics within individual tissues are limited. In particular, high-resolution metabolic maps of N dynamics in young maize shoot tissue are extremely scarce. The maize shoot encompasses an entire developmental gradient of sequentially initiating leaves [21, 22], and at any time-point a single plant possesses leaves of different ages corresponding to order of emergence, with the lowest leaf being the oldest . Additionally, leaf growth occurs in two dimensions, along the proximodistal and mediolateral axes. In maize, growth along the proximodistal leaf axis occurs basipetally: young sink tissue initiates near the base of the leaf blade (ligule), and differentiates towards the leaf tip [23, 24]. The mediolateral axis in maize is bilaterally symmetrical around the midvein. Additional longitudinal veins run parallel to the midvein and are interconnected by narrower transverse veins . Following uptake by roots, N and assimilates are transported over time through these developmental and spatial gradients, in part employing the vein network. In recent years, several authors have beautifully characterized metabolic, proteomic, and transcriptomic changes along a one-dimensional basipetal gradient in a single maize leaf [23, 24, 26, 27]. These studies utilized analytical chemistry techniques to examine N assimilates [23, 24, 26, 27]. A limitation of these analytic methods is that they do not permit in situ spatial analyses of metabolites and hence offer limited two-dimensional spatial resolution and overlook the critical vein network. Furthermore, when N is taken up by roots, N assimilates accumulate based not only on two-dimensional spatial gradients within a tissue, but also on tissue position and age (growing versus mature), relationships to other source/sink tissues, available N concentration, and time for uptake, assimilation and migration . Elucidating these multifactorial interactions would necessitate diagnostic technologies that are simple, low-cost and require minimal tissue in order to permit measurements of Gln and other N assimilates with thousands of data points. Whole-cell biosensors are engineered microbes that detect analytes, amplify the signal and emit a measurable output such as fluorescence or luminescence . Previously, we reported a biosensor for Gln, named GlnLux, based on an Escherichia coli Gln auxotroph which luminesces when exogenous, free Gln is supplied . We demonstrated that when GlnLux cells are exposed to Gln from maize tissue extracts, they multiply and release photons due to the presence of a constitutively expressing lux operon. The photons can be measured using a luminometer. We demonstrated that GlnLux output from maize leaf disk extracts highly correlates to high performance liquid chromatography (HPLC) measurements of Gln . 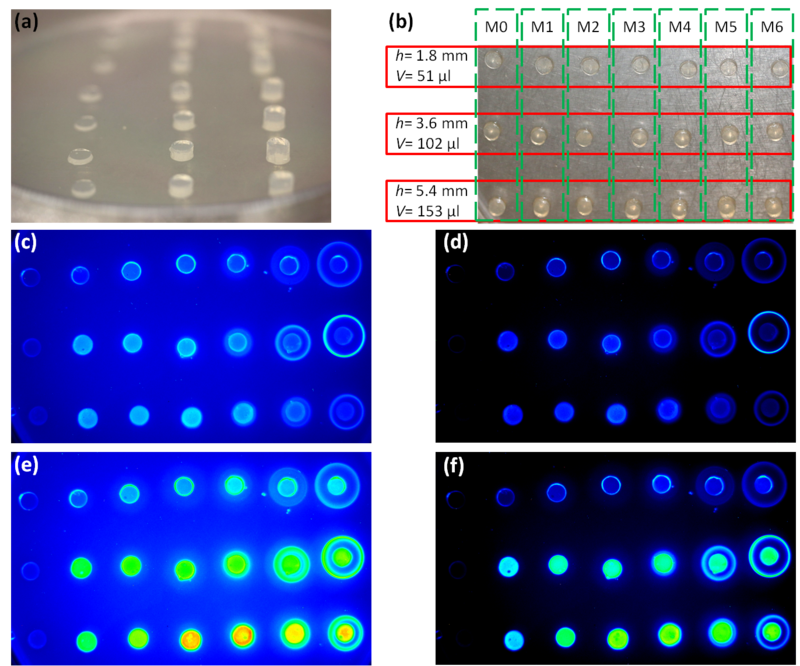 The technology was shown to be sensitive to < 1 nM Gln, suggesting it could be used for accurate, high-throughput Gln mapping using 96-well plates. To image Gln in situ directly from entire organs, they may be freeze-thawed to cause Gln leakage due to cellular damage, and placed on agar pre-embedded with GlnLux cells (GlnLux agar). This strategy ensures equal access of the tissue surface to biosensor cells, as opposed to direct incorporation which is impractical. Photons are released from the biosensor cells in proximity to the plant cells which can then be imaged using a photon capture charge coupled device (CCD) camera . The primary objective of this study was to use the GlnLux biosensor technologies to conduct detailed spatial and developmental gradient mapping of maize leaf Gln in response to different N rates and uptake/assimilation durations. The second objective was to determine if GlnLux in situ imaging could achieve resolution to the leaf vein level. Zea mays L. hybrid CG60 X CG102  seed was used for all experiments. Seeds were surface-sterilized by soaking 4 min in 70 % ethanol solution, 2 min in 4 % NaClO, followed by washing five times in sterile double distilled (dd) H2O. Seeds were germinated in 18-cell (two per cell, 8.5×8.5×9 cm) growth trays of Turface® (Profile Products, Buffalo Grove, USA), a baked-clay gravel with extremely low background levels of nitrogen (N). In previous experiments [30, 31] the gravel was found to contain 0.053 % N, of which only a fraction is available for plant uptake; N-free nutrient solution soaked with the Turface® gravel for 24 h was found to contain only 1.42 mg/L total N, equivalent to 0.1 mM. Growth flats were placed into plastic sub-irrigation trays (51×25.5×6 cm) containing 2 L ddH2O with no additional nutrients. For germination, the trays were initially placed in darkness in a laboratory cabinet at room temperature until plant emergence, thinned to one plant per cell, and arranged (completely randomized design, CRD) in a greenhouse with the following growing conditions: 28 °C/20 °C day/night (16 h/8 h), with 1000 W high pressure sodium and 1000 W metal halide lamps supplemented with GroLux bulbs, resulting in an average light intensity range of 803–1026 μmol m−2 s−1 (canopy level at noon). Plants were randomized daily and watered with ddH2O as needed. Twelve days after sowing (DAS), sub-irrigation trays were emptied of remaining ddH2O. Plants were supplied with one of six different modified Hoagland’s nutrient solutions consisting of 0.1 mM K2SO4, 1.0 mM KCl, 2 mM KH2PO4, 1 mM MgSO4·7H2O, 0.03 g/L chelated micronutrients (10046, Plant Products, Leamington, Canada) and either 0, 2, 5, 10, 15, or 20 mM total N provided as NH4NO3. Each nutrient solution (1.5 L) was poured into the sub-irrigation trays, with an additional 30 ml applied near the base of each plant. At various time-points after nutrient application (1, 6, 18, 12, and 24 h; starting at 9:30 AM, 2:30 PM, 8:30 PM, 2:30 AM, and 8:30 AM respectively), sampling was performed on leaves 1, 2, and 3, as defined by their order of emergence. Leaf tissue disks (6.35 mm in diameter) were harvested with a hand punch tool (235270975, Fiskar’s Brands Inc., Middleton, USA) at equally spaced intervals along the mid-vein, extending from the ligule region to the leaf tip in leaves 1 and 2. Because leaf 3 was still expanding, harvest of leaf disks extended from where the leaf exited the whorl to the tip. All tissue was frozen immediately in liquid N2, and stored at −80 °C. Three, five, and four different positions were harvested from leaves 1, 2 and 3 respectively. 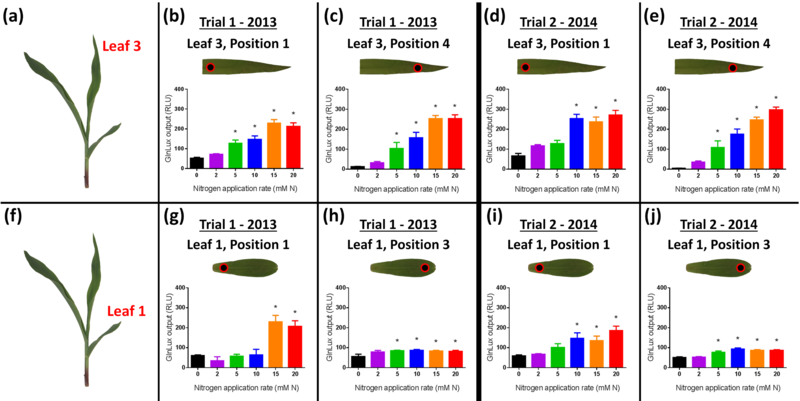 Four plants (replicates) were sampled for each time/nitrogen combination, and the most informative treatments were repeated in an independent trial. Leaf tissue disks were analyzed for glutamine (Gln) content with the GlnLux biosensor as previously described  with some modifications (Fig. 1a). Leaf disks were homogenized with a pellet pestle in a mixture of sterile sand and 20 μl 0.1 % chilled protease inhibition cocktail (PIC) (P9599-1ml, Sigma-Aldrich, St. Louis, USA), and centrifuged (model 5415R, Eppendorf, Hauppauge, USA; 4 °C, 20 min, 13 200 rpm). The resulting plant tissue extract supernatant was diluted 100-fold in 0.1 % PIC and stored overnight at −20 °C until analysis. Concurrently, GlnLux biosensor cells were cultured for 16 h in Luria Broth (LB) (37 °C) with shaking (245 rpm). Biosensor cells were then pelleted (2500 rpm, 10 min) and washed with M9 minimal growth media (DF0485170, BD, USA) three times. Cells were re-suspended in M9 media (OD595 = 0.025) and incubated for 16 h (37 °C, 245 rpm) to deplete endogenous Gln. All media were supplemented with 50 μg/ml kanamycin and 100 μg/ml carbenicillin, as GlnLux contains Kanr and Ampr resistance genes . Each leaf disk extract (10 μl) was combined with 10 μl prepared GlnLux cells and 80 μl M9 in white, flat bottom 96-well plates (07-200-589, Corning Inc., Corning, USA). 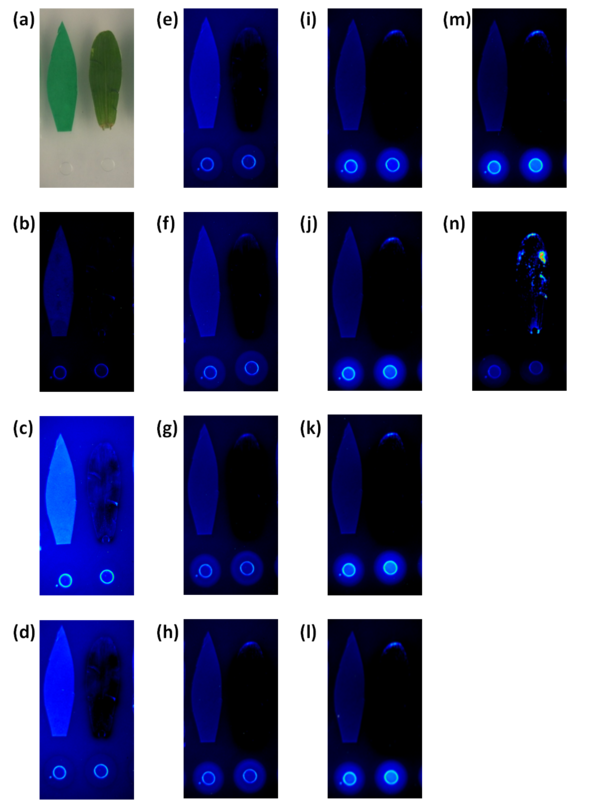 A negative control of 10 μl 0.1 % PIC in place of extract was also included on each 96-well plate for subtractive normalization of the luminescence data. Plates were incubated for 2 h to allow biosensor activation, then luminescence output was quantified using a 96-well luminometer (MicroLumatPlus, Berthold Technologies, Bad Wildbad, Germany) (37 °C, 1 s photon capture per well). Normalized luminometer data (raw outputs – negative control) was plotted against the duration of N uptake/assimilation, and against the N application rate. Outliers were identified and removed with ROUT, Q = 1 % . Means were compared with the Holm-Šídák method [33–35], or Dunnett’s multiple means comparison  at P < 0.05 as indicated in the figure legends. Kruskal-Wallis tests with Dunn’s multiple means comparisons were used where data displayed non-normality, as identified with Bartlett’s test [37–39]. All statistical analyses were performed in GraphPad Prism 6 (GraphPad Software Inc., San Diego, USA). As above, at 12 DAS, sub-irrigation trays were emptied of remaining ddH2O. Plants were then supplied with 0 or 20 mM total N (NH4NO3) provided as modified Hoagland’s nutrient solution (as described above). Again, 1.5 L of nutrient solution was poured into each sub-irrigation tray, and 30 ml near the base of each plant. Leaves were harvested after 1 h (starting at 9:30 AM), 12 h (8:30 PM) and 24 h (8:30 AM) of N uptake/assimilation. Harvesting of leaf 1 consisted of removing the entire leaf at the ligule. For the younger leaves, as the ligules had not yet developed, leaves 2 and 3 were cut from the plant where the leaf blade curled in upon itself to meet the stem. Three replicates were harvested per treatment combination, frozen immediately in liquid N2, and stored at −80 °C until imaging. To examine Gln diffusion through GlnLux agar, luminescence output from leaves was visualized over multiple, consecutive incubation intervals. Plants were initially germinated and grown with only ddH2O in Turface® gravel until they were at the same growth stage as the main experiments. Hoagland’s solution containing 20 mM N was then provided for 2 h, after which plants were moved back to N-free solution for a further 10 h. Leaves 1, 2, and 3 were harvested and placed on GlnLux agar alongside disk standards of Gln (0, 3.125 × 10−4, 6.250 × 10−4, 1.250 × 10−3, 2.500 × 10−3, 5.000 × 10−3, 1 × 10−2 M, left to right; volume = 51 μl, radius = 3 mm). Plates were imaged once before incubation, and then incubated at 37 °C for intervals of 1000 s with imaging following each interval. Plates were incubated a further 6.5 h and imaged. All images were captured with a 1000 s exposure and standardized to a range of 1000–6000 light intensity units in WinView (version 2.5.16.5, Princeton Instruments, Trenton, USA). To determine the effect that Gln diffusion through the GlnLux agar imposes on vein-level resolution, the diameters of midveins, longitudinal, and transverse leaf vein tissues were quantified with NIS-Elements (version 4.51, Nikon Instruments, Tokyo, Japan) following 4x brightfield microscopy (Nikon Eclipse 50i, Nikon Instruments). Diameters of longitudinal and transverse leaf vein tissues from whole-leaf in situ images were quantified with ImageJ (version 1.50i, NIH, Bethesda, USA) for comparison against microscopy with the Holm-Šídák test at P < 0.05 (GraphPad Prism 6, GraphPad Software Inc.). The veins of three biological replicates were quantified using both microscopy and in situ images. Three sets of agar Gln disks with different heights/volumes were prepared, scaling linearly (h = 1.8, 3.6, 5.4 mm; V = 51, 102, 153 μl. Radius was held constant at 3 mm). The molarity of Gln within the standards was held constant across the three different height/volume levels (0, 3.125 × 10−4, 6.250 × 10−4, 1.250 × 10−3, 2.500 × 10−3, 5.000 × 10−3, 1 × 10−2 M Gln). Image standardization was applied using WinView software (version 2.5.16.5, Princeton Instruments) (1000 s exposure, 1000–6000 light intensity units) after 2.5 and 6 h.
Three sets of agar Gln disks with different heights/volumes were prepared, scaling linearly as above. However, total moles of Gln within the standards was held constant across the three different height/volume levels (0, 15.94, 31.87, 63.75, 127.5, 255.0, 510.0 nmol). Image standardization was applied using WinView software (version 2.5.16.5, Princeton Instruments) (1000 s exposure, 1000–6000 light intensity units) after 2.5 and 6 h.
After a 12-day N starvation period, plants were provided with varying N concentrations ranging from 0–20 mM for N uptake/assimilation periods spanning 1 - 24 h before sample collection (Fig. 2). Leaves were then analyzed for relative free glutamine (Gln) levels using the leaf punch GlnLux assay (Figs. 1a and 2 and Additional file 1: Figure S1). Generally, for a given spatial position, increased N rate and duration of N uptake/assimilation induced greater GlnLux output (Fig. 2 and Additional file 1: Figure S1), but interestingly this varied by leaf position (see below). A smaller independent second trial confirmed these trends (Additional file 2: Figure S2). Additionally, in situ images of Gln accumulation in whole leaves were generated by placing them on GlnLux agar (Figs. 1b and 3). When plants were provided with either 0 (−N) or 20 (+N) mM total N, leaves showed similar trends as were observed using the leaf punch assay (Fig. 3). This was especially evident in leaves 2 and 3 (Fig. 3). Using the leaf punch assay, GlnLux output showed dependency on leaf age (order of emergence) along the shoot axis (Fig. 2 and Additional file 1: Figure S1). At equivalent relative sampling positions, the oldest leaf (leaf 1) generally displayed the lowest output levels, while leaves 2 and 3 displayed progressively higher output based on the GlnLux leaf punch assay (Fig 2 and Additional file 1: Figure S1). Trial 2 was consistent with these results (Additional file 3: Figure S3). 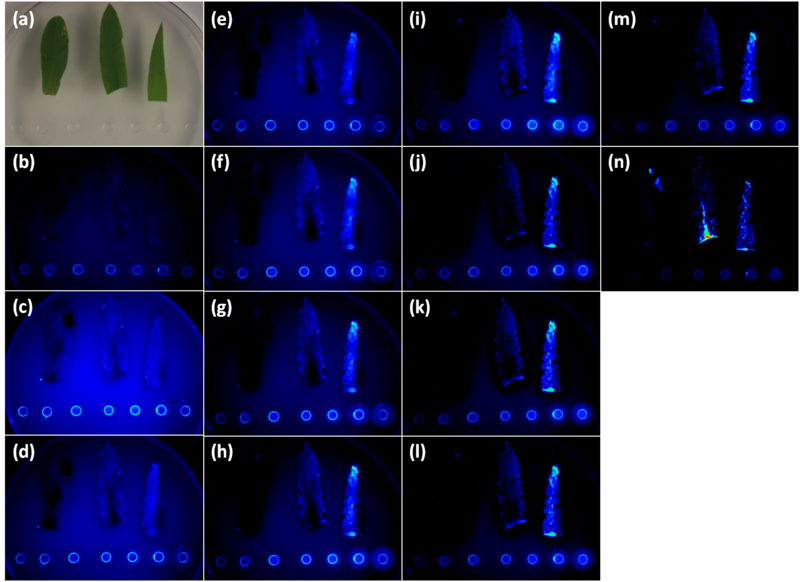 The trend was also clearly observed in the in situ images which showed dramatically increased luminescence output in leaf 3 compared to leaf 1 for + N treated plants, with leaf 2 showing an intermediate response (Fig. 3). The leaf punch assay showed that GlnLux output was dependent upon the sampling position along the proximodistal axis within a leaf (Fig. 2 and Additional file 1: Figure S1). Specifically, positions nearing the base of a leaf showed increasing responses to N rate and duration compared to the tip (a basipetal gradient) which was especially clear in leaves 1 and 2, but less pronounced in leaf 3 (Fig. 2 and Additional file 1: Figure S1). Trial 2 was consistent with these results (Additional file 3: Figure S3). The in situ images of Gln accumulation similarly showed greatest GlnLux output towards the base of leaves 2 and 3 in + N treated plants. Leaf 1 of N treated plants showed low and variable GlnLux output. In general, there was symmetry in GlnLux output along the mediolateral axis from the midvein to the leaf edges (Figs. 3 and 4). However, asymmetric patches of high and low intensity were observed (Fig. 4). The in situ images attained vein-level resolution, revealing fine-scale details of Gln localization (Fig. 4). Luminescence could be observed in both the large and small parallel longitudinal veins along the proximodistal axis (Fig. 4a, b). In the transverse veins (along the mediolateral axis) that connect the longitudinal veins, luminescence could also be observed (Fig. 4a). Intense luminescence was sometimes observed along apparently connected networks of longitudinal veins and transverse veins (coloured tracing, Fig. 4c). Although there was clear separation between leaf veins, it was determined that the level of resolution attained with GlnLux imaging is less than standard light microscopy (Additional file 4: Figure S4) likely due to a combination of photon scatter and limited Gln diffusion in the agar (Additional file 5: Figure S5). 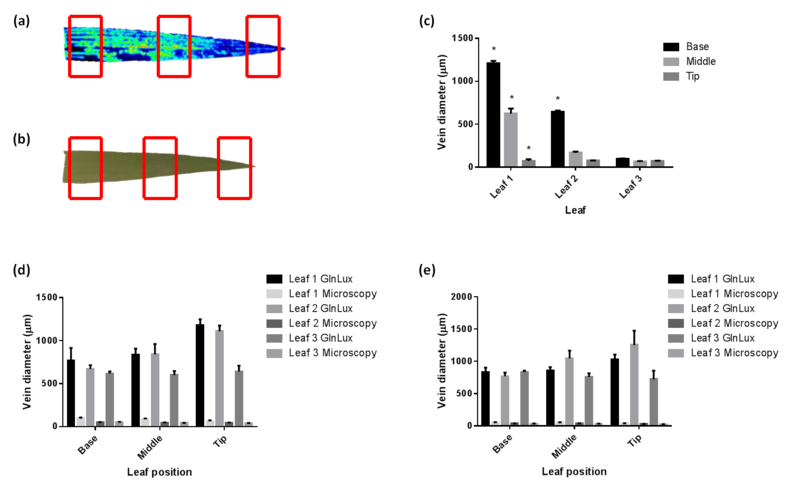 In this study, the high sensitivity of the GlnLux biosensor (< 1 nM)  permitted small leaf disks to be used for relative Gln measurements which facilitated detailed spatial leaf analysis. The low cost (~$1 USD per sample) and high-throughput nature of the protocol enabled > 1500 samples to be processed to provide a detailed spatial/temporal map of relative Gln in a young maize shoot. Leaf disks sampled along the midvein displayed increasing gradients of GlnLux output based on increased N application rate and duration of N uptake/assimilation, and position along the leaf proximodistal axis and shoot axis (Fig. 2 and Additional file 1: Figure S1). The more intensive technique, Glnlux imaging, permitted these gradients to be visualized in situ in two-dimensions along both the leaf proximodistal and mediolateral axes (Figs. 3 and 4) and for the first time at vein-level resolution (Fig. 4). Previous studies have observed a rapid appearance of Gln in maize leaf tissue following N application [10, 40]. In leaf 2 harvested from young maize plants, Gln was shown to accumulate in a basipetal gradient peaking at the base . More recently, highly-detailed analyses revealed that Gln and transcripts related to protein metabolism displayed a similar gradient in leaf 3 [24, 26, 27]. The progressively higher GlnLux output along the shoot axis (Fig. 3) likely indicates preferential shuttling of assimilatory metabolites into young, photosynthetic, growing tissue [6, 41, 42]. Alternatively, there may be fundamental differences in anatomy (with implications on underlying physiology) between leaves 1–3, though they are classified within the same, embryonic phase of development [43–45]. The studies detailed above concerning the basipetal gradient [9, 24, 26, 27] were performed on a single maize leaf (leaves 2 or 3). The present report is, to the best of our knowledge, the first time such analysis has been performed on different leaves sampled simultaneously on the same plant following application of multiple N rates and durations of uptake/assimilation. When the high-throughput nature of the GlnLux leaf punch assay was combined with the detailed in situ images, several complex interaction effects could be identified. Specifically, at least five types of interactions were observed: (1) an N rate x N duration interaction (additive, Figs. 2 and 3); (2) an N rate/duration X shoot axis interaction (N preferentially observed in younger leaves, Figs. 2a-j and 3); (3) a shoot axis X leaf proximodistal interaction (leaves 1 and 2 showed greater leaf-basipetal gradients than leaf 3, Figs. 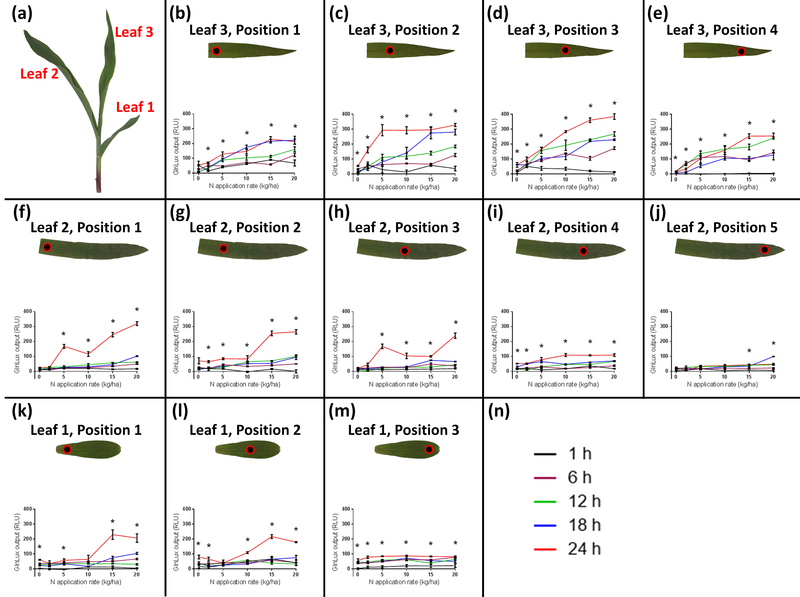 2 and 3); (4) an N rate/duration X leaf proximodistal interaction (only the highest N rates showed a leaf basipetal gradient in leaf 1 in contrast to leaf 2, Figs. 2f, k and 3); (5) and interactions with the leaf mediolateral axis (Figs. 3 and 4) (generally proximodistal and mediolateral axes expression were coincident). These interactions, uncovered using the GlnLux technologies, reveal the complexity of N assimilatory dynamics even at the seedling stage. Current methods utilizing tracer dyes in conjunction with microscopy, x-ray imaging, or magnetic resonance imaging (MRI) are able to observe veins with a fine level of detail [46–50]. However, such analysis is generally restricted to noting the presence/absence of fluid without visualization of specific metabolites. Additionally, most studies are performed on cross sections of stem tissue without providing images of entire leaves. Radioisotope labelling (13C or 15N) might be used to track movement of metabolites [51, 52], but labelled nitrogen applied to plant roots would be incorporated into other assimilatory metabolites besides free Gln (e.g. other amino acids, protein, chlorophyll). Here GlnLux in situ imaging permitted visualization of free Gln at vein-level resolution. Intense GlnLux signal was observed in some leaf locations as branch patterns of apparently interconnected longitudinal and transverse leaf veins (coloured tracing, Fig. 4c). Combined, these branches formed a visible network, interspersed with patches of low intensity. The simplest interpretation is that Gln does not diffuse randomly through the vein network but rather can have preferential vascular routes, either to supply local needs or perhaps to bypass spots of vascular damage. The leaves may have been damaged during the procedure, forcing Gln along detours to reach its destination. Specifically, there may have been physical damage to the veins during tissue handling, or cavitation-induced embolisms (air bubbles) might have formed associated with leaf dissection or freezing. All have implications for how plants respond to similar events in the real world [46–48, 53], for example, associated with pest damage, vein callose formation and the formation of ice crystals. GlnLux in situ imaging should allow future investigation of such hypotheses and may enable a new field of N assimilate research. Caution must be exercised when analyzing leaf veins with GlnLux, as visualized leaf vein tissue (luminescence) has a larger diameter than that quantified with light microscopy, suggesting a degree of diffusion and/or light scatter (Additional file 4: Figure S4). Further examination of luminescence produced by leaves on GlnLux agar over multiple consecutive incubation intervals (1000 s) showed insignificant rates of diffusion from leaves as compared to the diffusion-prone Gln agar standards (Additional file 5: Figure S5). The literature suggests that the concentration range of Gln in maize leaves ranges from 0.06 to 1.1 μmol/g fresh weight . A disadvantage of the GlnLux techniques is that only relative and not absolute concentrations of Gln are reported. Inclusion of a standard curve of pure Gln, although highly replicable (Additional file 6: Figure S6 and Additional file 7: Figure S7), is difficult to interpret, in part due to differences in diffusion rates compared to leaf tissue (see above). Furthermore, maize leaves contain many metabolites, at least some of which are likely to impact the growth of the GlnLux E. coli cell, perhaps negatively (Additional file 8: Figure S8). However, this negative effect is presumably imposed equally across all tissues and N treatments (visible in Additional file 5: Figure S5). With respect to the leaf disk assay, the thickness of the leaf vein does vary, potentially adding to the experimental error. Different thicknesses may impose a confounding effect with respect to GlnLux in situ imaging, similar to that observed with Gln standard disks of different heights/volumes (Additional file 6: Figure S6 and Additional file 7: Figure S7). Tissues of different thickness may have differential rates of diffusion into GlnLux media. Image analysis is relative, and hence it is critical to have the treatment and control on the same plate. 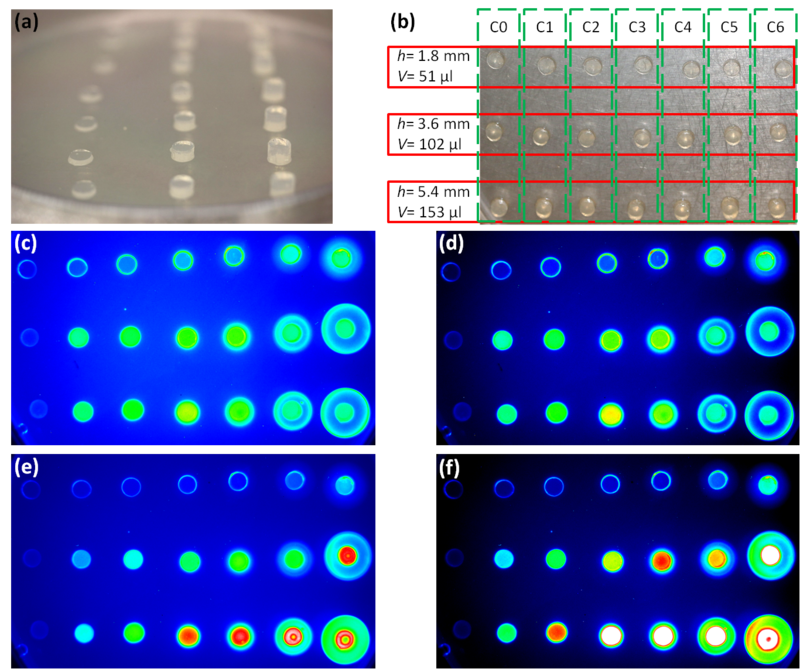 However, biosensors conceptually similar to GlnLux which rely on diffusion of metabolites into agar media have been utilized previously with good correlation of image intensity and independent metabolite quantification . An additional limitation is imposed by the slight curvature of leaf blades, causing incomplete adherence to the GlnLux agar, resulting in dark zones (Fig. 3). Furthermore, tissue cracking can result in localized fluid leakage, resulting in artefacts (e.g. Fig. 3, compare light image to GlnLux image for top replicate of leaf 1, −N, 12 h). Finally, the finite amount of tissue that can be processed simultaneously in the imaging protocol might be considered a limitation. However, if GlnLux plates are properly staggered, plate-to-plate variability does not confound the results (Additional file 9: Table S1). Gln is central to primary N metabolism and therefore potential applications of the GlnLux technologies are wide-ranging. The GlnLux assays may facilitate detailed metabolic studies, in which high replicate numbers have been suggested as ideal [55–57]. Specifically the assay may be used to probe more complex N dynamics, diurnal rhythms, time-courses of N uptake/assimilation, and to create high-resolution maps of Gln movement. These methods may be applied to other species, as well as to different organs including roots . Additionally, mature plants at later growth stages may be examined. As mature leaves enter senescence it might be of interest to track the remobilization of Gln from shoot tissue to grain, which has been shown to improve nitrogen use efficiency (NUE), defined as the N fertilization requirement per unit of production [58, 59]. The high processing power of the GlnLux leaf disk assay may enable screening of genotypes, and breeding for improved NUE by providing links between genetic and phenotypic traits on a fine scale [57, 60]. We thank Dietmar Scholz (University of Guelph) for assistance in maintenance of the greenhouse experiments, and Hanan R. Shehata (University of Guelph) for training TLG in the use of the GlnLux methodologies. We thank Elizabeth A. Lee (University of Guelph) for the gift of maize seeds and Mary Ruth McDonald (University of Guelph) for the use of a light microscope. TLG was supported in part by scholarships from the University of Guelph, a QEII-GSST award from the Government of Ontario, and an NSERC-PGSD award from the Government of Canada. This research was supported by grants to MNR from the Ontario Ministry of Agriculture, Food and Rural Affairs (OMAFRA), Grain Farmers of Ontario and the Natural Sciences and Engineering Research Council of Canada (NSERC, CRD Program). The datasets supporting the conclusions of this article are included within the article and its Additional file 1: Figure S1; Additional file 2: Figure S2; Additional file 3: Figure S3; Additional file 4: Figure S4; Additional file 5: Figure S5; Additional file 6: Figure S6; Additional file 7: Figure S7; Additional file 8: Figure S8; Additional file 9: Table S1. TLG and MNR conceived of the study. TLG undertook all lab experiments, performed all analyses and wrote the manuscript. MNR edited the manuscript. Both authors have read and approved this manuscript. The authors declare that the research was conducted in the absence of any commercial or financial relationships that could be construed as a potential conflict of interest. However a US Patent has been issued on the technology (US 61/499286). MNR serves as an editorial board member for BMC Plant Biology.